Traditional wedding flowers never go out of style, but these days brides and wedding florists are coming up with unexpected uses for floral arrangements. One hot trend is decorating a cupcake tower as though it were a wedding cake. 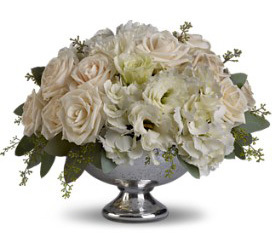 Unique floral arrangements can transform a time-honored tradition like the unity candle into something truly your own. 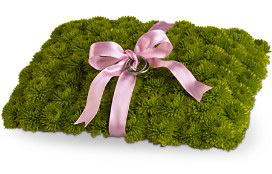 By exposing you to the latest industry trends, your florist can give you more options for personalizing your wedding. See our predictions for this year's latest wedding flower color trends. Choosing to use seasonal flowers in your wedding arrangements can help you incorporate the natural beauty of the season and save on the total cost of your wedding flowers. A professional florist knows exactly when different flower types come into season. 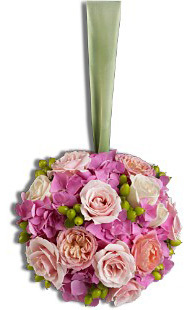 He or she is an expert at integrating cost-effective and seasonally-appropriate flowers into your overall design. Spring, summer, fall or winter-the result will be breathtaking. Read more about seasonal wedding flowers: Summer wedding flowers, spring wedding flowers, fall wedding flowers, winter wedding flowers. The bouquet you carry as you walk down the aisle makes a powerful statement about what kind of bride you are. It's the most prominent accessory you'll have on your wedding day, and it will live on in your wedding photos. From romantic, cascading bouquets to simple hand-tied arrangements, the goal of the bride's bouquet is to emphasize your natural beauty. Just like trying on wedding dresses, meeting with a florist to discuss your bridal bouquet is a time for you to be creative, have fun, and find your perfect look. Each bridesmaid you choose to be a part of your wedding has been there for you in her own way. Whether she's your childhood partner-in-crime, your college roommate, or your sister, she brings her own personality to your wedding. The ceremony just wouldn't be complete without each one. 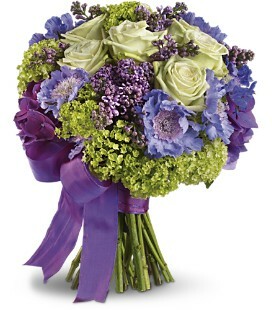 Celebrate your wedding party with great bridesmaid bouquets they'll be able to take home and treasure. 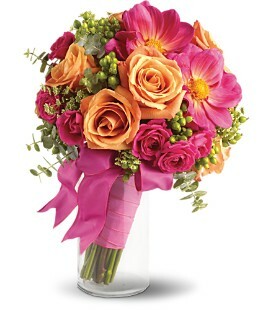 Maybe you'll coordinate their bouquets or create variations on a theme. Whatever you choose, wedding party bouquets and boutonnieres complete your wedding look. Your Teleflora florist will take care of the extra details that will set your wedding apart in the memories of your guests. Our florists can provide full service wedding services, from dramatic archways to the toss bouquet. Of course, you'll be closely involved in every step of the process-except the stress. Find a wedding florist near you today. Many brides are unfamiliar with the art of floral arrangement before becoming engaged, and even the basics can quickly become overwhelming. That's where your wedding florist comes in. Some brides choose to buy flowers wholesale and attempt to design them themselves. They arrive in a cardboard box, a couple of days before the wedding. Brides and their family members scramble to arrange the bouquets and figure out a way to store large arrangements properly before the big day. Unexpected material costs quickly retract from the actual savings. There are many aspects of a wedding that lend themselves to a "DIY" method, but floral design is not one of them. Doing it yourself also means spending much of your wedding week figuring out how to arrange and store flowers, rather than socializing with relatives and loved ones from out of town. A wedding florist will always be sensitive to the needs of your budget. Your flowers won't come in a box; they'll be carefully set up in the venue by your florist at the peak of freshness. This leaves you time to really enjoy your wedding day. That's the Teleflora florist difference. 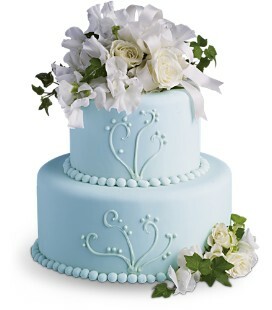 Find your own Teleflora wedding florist listed by city and state.